If I was to describe my ‘interiors journey’ this year in my home, it would have to be titled “The Year Of The Splashback.” After our cooker packed up the day before last Christmas, the New Year involved a new oven, the ripping out of our old splashback, plus my first DIY tiling experience. My DIY-d splashback was then built over for a stint of filming in the summer, before the ‘fake’ splashback was removed again! The next stage in the journey was to learn that if you require a splashback you need not mess around with tiling, grout, or custom cut-to-size glass or acrylic. Instead, you can purchase them with a self-adhesive backing that sticks straight on your wall from British Ceramic Tile! Now, I like to think that I am pretty savvy on DIY, time-saving and effective interior products like this, but I had NO IDEA you could buy these until British Ceramic Tile got in touch about their new limited edition glass splashback in association with Laura Ashley, celebrating Laura Ashley’s 65th birthday. British Ceramic Tile have been producing a range of wall and floor tiles for the exceptionally British and widely respected Laura Ashley for a while. 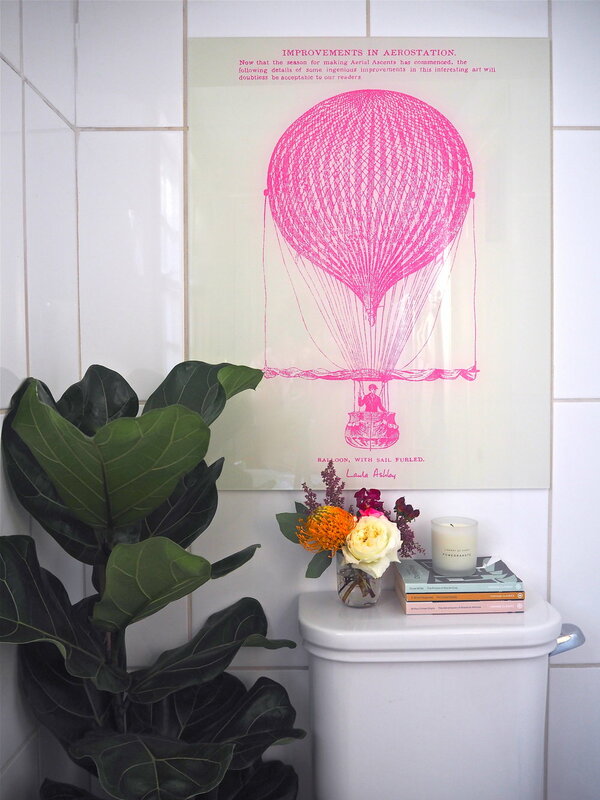 More commonly known for their fabrics, wallpapers and home accessories, they have a gorgeous range that are perfect for period hallways and bathrooms that I’ve long been a fan of. You can buy them direct from British Ceramic Tile, the UK’s leading ceramic tile and glass splashback manufacturer who are commemorating this with a large limited edition glass splashback tile. 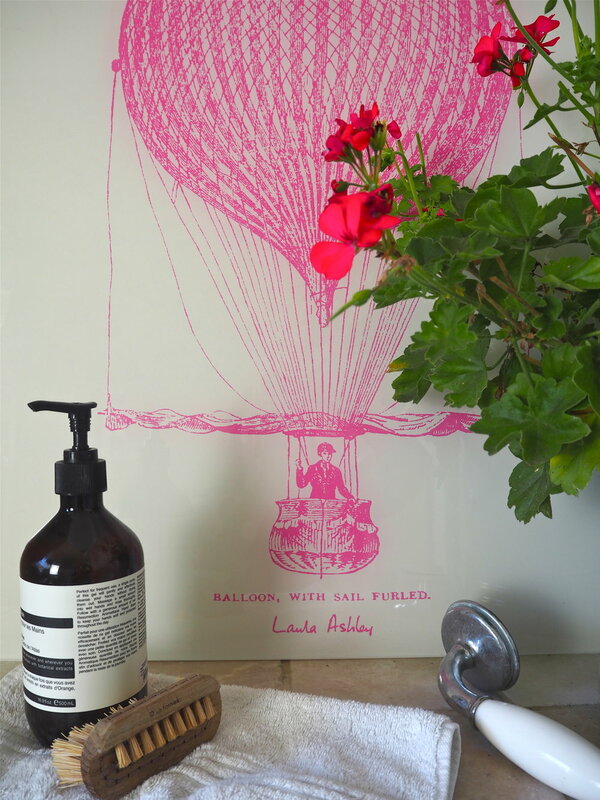 The design of the splashback features a hot-air balloon in an equally hot-pink colourway, with the historic print being inspired by an issue of 'The Illustrated London News' from 1846, the world's first illustrated weekly news magazine. 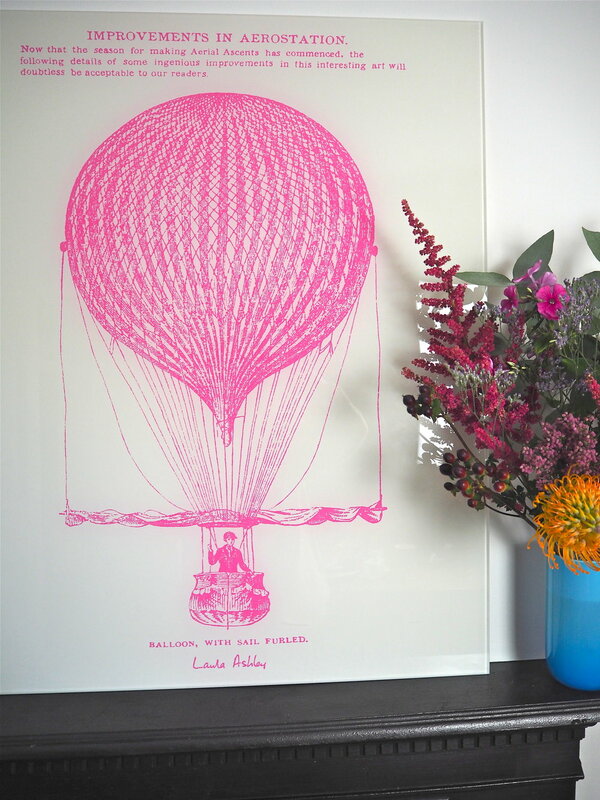 Last week British Ceramic Tile sent me one of these limited edition splashbacks and it was so lovely to look at I decided that instead of a splashback, I would use it somewhere else in my home instead as a piece of art. There were a few places that I found it suitable, so, where did it end up in my home….? At 60x75cm the splashback was the perfect size to be perched above my period cast-iron fireplace in my dining room. These old fireplaces are notoriously slim, so it needed an artwork that rested upon it perfectly. By having the splashback resting on the fireplace rather than hung above it, it has a much more casual, relaxed feel. I really loved the mix of the black/white/hot pink, but any basic framed picture could be placed here, so I decided to be more inventive with my large glass tile…. When we moved into this house we inherited a large walk in shower with a perch to sit on. It’s a great shower, but the boring beige tiles do nothing for me. 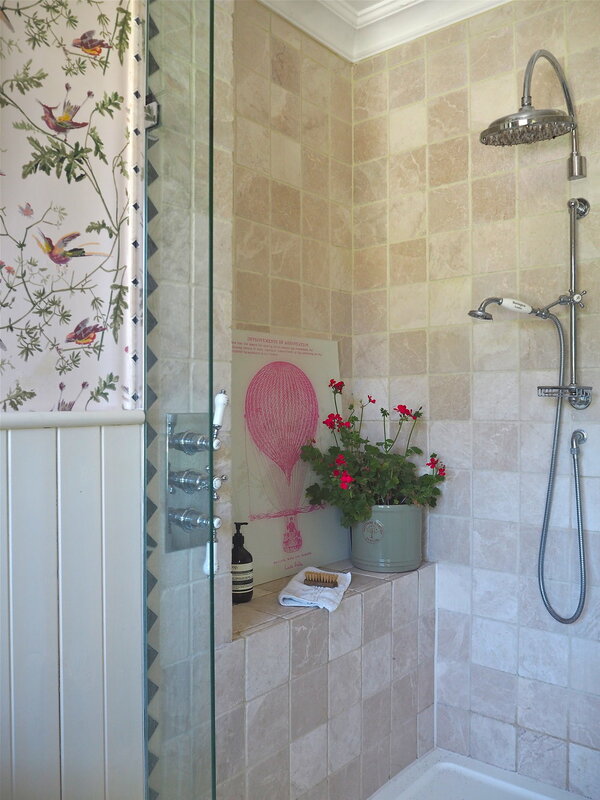 Ideally, I’d love a shower featuring an artisan tile in a more snazzy colourway, but for now I have to make do. Instead, I just ‘style up my shower’ and this limited edition splashback is perfect as the water from the shower just runs off the toughened glass which can withstand the highest temperature without the glass cracking. After showering, it can just be wiped down with a damp cloth. All I needed to do was make sure the wall was clean and free from any grease, dust and dirt. I then peeled off the cover from the adhesive backing and stuck the splashback firmly over the tiles. To stop any damp or dust getting behind the splashback, I just used a decorators caulk to seal the edges of the splashback with the wall. I’m delighted with my new loo artwork! It just feels a much more inviting space than the sanitary white toilet that it was before. This limited edition splashback is available to buy from the British Ceramic Tile website from the 15th October. To celebrate the launch of this product, British Ceramic Tile are running a competition to win one of these limited splashbacks. To find out more information and to enter the competition, click here. If you are after wall and floor tiles for a project in your home, then you might like to know that Laura Ashley have recently released a new range this Autumn. Check out all the new designs here. * This post is a collaboration with British Ceramic Tile, however, as mentioned in the post I was so impressed with this products concept I really wanted to write about it on the blog. I am also a big supporter of UK & UK based companies. As usual, all thoughts, opinions and styling is my own.